The Four Tops are an American vocal quartet that rose to the top of pop and R & B charts with such number-one hits as "I Can't Help Myself (Sugar Pie, Honey Bunch)" and "Reach Out I'll Be There." The group was the main male vocal group for the Motown songwriting and production team of Holland-Dozier-Holland, who crafted the Four Tops stream of hit singles in the mid to late 1960s. After founding the group in Detroit, Michigan, as The Four Aims, lead singer Levi Stubbs and groupmates Abdul "Duke" Fakir, Renaldo "Obie" Benson, and Lawrence Payton remained together for over four decades, but were finally forced to endure a lineup change when Payton died in 1997. Theo Peoples was then added to the group, later replacing Stubbs, who fell ill from a stroke, on lead vocals. The Four Tops were notable for having a baritone, namely Levi Stubbs, as their lead singer. Stubbs' gospel-oriented vocals pushed the limits of his range and helped create the group's characteristic combination of raw emotion mixed with slick sophistication and grace. The Four Tops had 24 Top-40 hits over their career and were inducted into the Rock and Roll Hall of Fame in 1990. All four members of the group began their careers together while they were high school students in Detroit. At the insistence of their friends, Pershing High students Levi Stubbs and Abdul "Duke" Fakir performed with Renaldo "Obie" Benson and Lawrence Payton from Northern High at a local birthday party. The quartet decided to remain together and christened themselves The Four Aims. 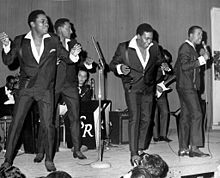 With the help of Payton's songwriter cousin, Roquel Davis, The Aims signed with Chess Records in 1956, changing their name to the Four Tops to avoid confusion with The Ames Brothers. Over the next seven years, The Four Tops endured unsuccessful tenures at Chess, Red Top, Riverside Records, and Columbia. Without any hit records to their name, The Tops toured frequently, developing a polished stage presence and an experienced supper-club act. In 1963, Berry Gordy, Jr., who had worked with Roquel Davis as a songwriter in the late-1950s, convinced The Tops to join the roster of his growing Motown record company. 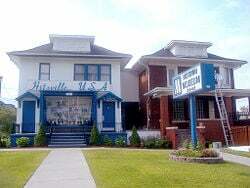 The Hitsville U.S.A. building in Detroit, Michigan, which served as Motown's headquarters from 1959 until 1968. During their early Motown years, the Four Tops recorded jazz standards for the company's Workshop label. They also sang backup for Motown headliners such as The Supremes. Their big break came in 1964, when Motown's main songwriting/production team of Holland-Dozier-Holland created a complete instrumental track without a clear idea of what to do with it. They decided to craft it into a mainstream pop song for the Four Tops and proceeded to create, "Baby I Need Your Loving" from the wordless instrumental track. Upon its mid-1964 release, "Baby I Need Your Loving" made it to number 11 on the Billboard U.S. pop charts. It did better, however, on trend-setting radio stations in key U.S. markets. It was a strong top-10 hit on both WMCA in New York and WKNR in Detroit, stations known to radio industry people all over the country for promoting hot new artists and songs. After the single's success, The Tops were pulled away from their jazz material and began recording more records in the R & B and pop vein. However, their first follow-up single, "Without the One You Love (Life's Not Worth While)," missed both the pop and R & B Top 40 charts. "Ask the Lonely," released early in 1965, was a Top 30 pop hit and a Top 10 R & B hit. From that point on, the Tops' fortunes began to improve dramatically. The Four Tops scored their first Number One hit, the often-covered and revived "I Can't Help Myself (Sugar Pie, Honey Bunch)," in April 1965. This launched a long series of successful hit singles. Among the first wave of these hits were "It's the Same Old Song," "Something About You," "Shake Me, Wake Me (When It's Over)," and "Loving You is Sweeter Than Ever." Four Tops' records often represented the epitome of the Motown Sound: Simple distinctive melodies and rhymes, call-and-response lyrics, and the musical contributions of the The Funk Brothers background instrumentals, notably the prominent creative bass lines by James Jamerson. Holland-Dozier-Holland wrote most of Levi Stubbs' vocals in a tenor range, near the top of his range, in order to get a sense of strained urgency in his gospel preacher-inspired leads. They also used additional background vocals from female background vocalists, The Andantes on many of these songs to add a high end to the low-voiced harmony of The Tops. August 1966 brought the release of the Tops' biggest hit, and one of the most popular Motown songs ever: "Reach Out I'll Be There," which hit Number One on the U.S. pop charts and soon became The Tops' signature song. It was almost immediately followed by "Standing in the Shadows of Love," a similar sounding song, but whose depictions of heartbreak reflected the polar opposite of the optimism expressed in "Reach Out." It was another Top 10 hit for the Tops. Another major U.S. hit, "Bernadette," continued the Four Tops' successful run in February 1967, followed by the Top 20 hits "7-Rooms of Gloom" and "You Keep Running Away." By now, The Tops were the most successful male Motown act in the United Kingdom and were second only to The Temptations) in the U.S. They also began experimenting with more mainstream pop hits virtually unrelated to their R & B roots. The Tops scored hits with their versions of Tim Hardin's "If I Were A Carpenter" in late 1967 and the Left Banke's "Walk Away Renée" in early 1968. These singles, together with "I'm In a Different World," were their last hits produced by Holland-Dozier-Holland, who left Motown in 1967 after disputes with Berry Gordy over royalties and ownership of company shares. Without Holland-Dozier-Holland, the quality of the Four Tops' output, like that of most of Motown, began to decline, and hits became less frequent. The group worked with a wide array of Motown producers during the late-1960s, including Ivy Hunter, Nickolas Ashford & Valerie Simpson, Norman Whitfield, and Johnny Bristol, without significant chart success. The Tops' first hit single in several years came in the form of 1970s "It's All in the Game," produced by Frank Wilson. Wilson and The Tops began working on a number of innovative tracks and albums together, echoing the psychedelic soul work of The Temptations. The Tops' 1970 album Still Waters Run Deep, an early example of the concept album, served as an inspiration for Marvin Gaye's 1971 classic album, What's Going On. The title track of Gaye's album was co-written by The Tops' Obie Benson. In addition to recording their own albums, The Tops were paired with The Supremes, who had just replaced lead singer Diana Ross with Jean Terrell, for a series of albums billed under the joint title The Magnificent Seven. While the albums themselves did not do well on their charts, The Magnificent Seven featured a Top 20 version of Ike & Tina Turner's "River Deep—Mountain High," produced by Ashford & Simpson. The 1971, single "A Simple Game" featured backing vocals from members of The Moody Blues. The song did not fare well on the U.S. charts, but reached number three on the UK charts. The Motown company began to change in a number of ways during the early 1970s. Older acts such as Martha Reeves & the Vandellas and The Marvelettes were being slowly pushed aside to focus on newer acts such as The Jackson 5, Rare Earth, Michael Jackson, and the now-solo Diana Ross. In addition, the company was moving many of its operations from Detroit to Los Angeles, California, where Berry Gordy planned to break into the motion picture and television industries. In 1972, it was announced that the entire company would move to Los Angeles, and that all its artists had to move as well. Many of the older Motown acts, already neglected by the label, opted to stay in Detroit, including The Funk Brothers backing band, Martha Reeves, and the Four Tops. The Tops departed Motown for ABC-Dunhill. There, "Keeper of the Castle" became their first pop top-10 hit since "Bernadette" in 1967. Follow-ups such as "Ain't No Woman (Like the One I've Got)," "Sweet Understanding Love," "Midnight Flower," and "One Chain Don't Make No Prison" hit the R & B Top Ten between 1972 and 1974. However, by the time of the release of "Catfish" in 1976, the hits had dried up again. The group disappeared into obscurity in the late-1970s. Scoring a deal with Casablanca Records in 1980, the Tops made a brief comeback in 1981 with the Number One R & B hit "When She Was My Girl." By 1983, The Tops had rejoined Motown and were featured on the company's television special Motown 25: Yesterday, Today, Forever. One of the highlights of the show was a battle-of-the-bands between The Tops and The Temptations, patterned after similar competitions Berry Gordy had staged during the 1960s. Levi Stubbs and Temptation Otis Williams decided the Temptations/Tops "battle" would be a good one to take on the road, and both groups began a semi-regular joint tour, which has continued through 2007 and beyond. Since the late-1980s, the Four Tops have focused on touring and live performances, only recording one album, 1995's Christmas Here With You, released on Motown. On June 20, 1997, 59-year-old Lawrence Payton died as a result of liver cancer, after singing for 44 years with the Four Tops. The group, unlike many Motown acts, never had a single lineup change until then. At first, Levi Stubbs, Obie Benson, and Duke Fakir continued to tour as a trio called The Tops. In 1998, they recruited former Temptation Theo Peoples to join the act to restore the group to a quartet. By the turn of the century, Stubbs had become ill from cancer; Ronnie McNair was recruited to fill in the Lawrence Payton position, and Peoples stepped into Stubbs' shoes as lead singer. On October 1, 1988, the Four Tops reached the Top 40 for the twenty-fourth and final time with “Indestructible.” NBC-TV used the song as a theme for its coverage of the 1988 Summer Olympics. The Four Tops were inducted into the Rock and Roll Hall of Fame in 1990, with Stevie Wonder as their presenter. On February 20, 1997, the Tops received the Pioneer Award for Lifetime Achievement at the eighth annual Rhythm & Blues Foundation dinner in New York. They joined into the Vocal Group Hall of Fame in 1999. In 2004, Rolling Stone Magazine ranked the Tops #79 on their list of the 100 Greatest Artists of All Time. ↑ Rolling Stone, The Immortals: The First Fifty. Retrieved June 27, 2008. Abbott (ed.). Calling Out Around the World: A Motown Reader. London: Helter Skelter, 2000. ISBN 978-1900924146. Pascall, Jeremy, and Rob Burt. The Stars and Superstars of Black Music. Secaucus, N.J.: Chartwell Books, 1977. Rubiner, Julia M. Contemporary Musicians: Vol. 11. Detroit: Gale Research, Inc. 1994. ISBN 978-0810385528. This page was last modified on 20 April 2017, at 14:46.